Dog potty training can be a challenging task but it can be fun at the same time. Having a pet especially a dog at home is really a great feeling. But adding a new member to your family is surely going to add up new responsibilities and challenges. One of the foremost challenges that you are going to face with your new puppy is to train him to potty at the right spot and time. This makes potty training a significant part of the overall taming process of your cute little dog. Because you do not want the puppy to damage your furniture, and soil your expensive rugs and mats, right. Below I have shared with you five useful tips and tricks that can aid in potty training your new pet. It will definitely get you started on a cheerful long future together. 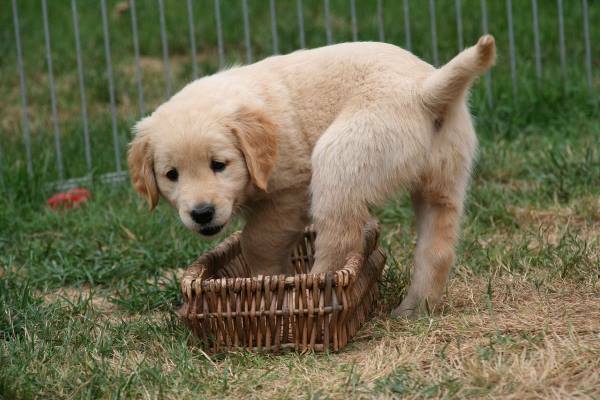 Crate training or playpen training might seem a little harsh when you are potty training your puppy. But this is actually a great way to coach your new pet to defecate at the right place. If you so want, you can stop using this powerful tool once your puppy forms the right set of habits. Dogs love to stay clean and tidy. And a crate will help them to do so because your dog will treat the crate as their mini-home. So if you pay little attention, you will notice that a dog will always excrete away from its home. It will never soil the rug, which is near to its belongings. But you need to be careful while choosing a crate for your dog because you want to buy the right one. It should be big enough to accommodate him. But not too spacious that it can give him/her space for urination in the corners. Yes that’s what little puppies do. In crate training, it is important to pay special attention to your puppy when it starts to whine and scratch the crate. It is a sign for you to understand that it needs to go out for a pee or poo. If that happens do not delay, and take him out as quickly as possible because if you do not hurry, it can excrete in the crate. And we don’t want that, right. Because if he/she gets into the habit of excreting in the crate, it will prove to be a great trouble for you; as the puppy will think that it is fine to poop inside the crate. If you are a working person, then schedule training is the best option for you to Potty train your Canine. You will need to monitor your puppy and make it a habit for him/her to go out from a very small age. It is good to follow proper routine and take them out to excrete at regular intervals. If you do it regularly, it will bring discipline and it will program their mind. Slowly and steadily this routine will turn into a good habit for your dog. Then you will never have to worry about mess in your beautiful home. Puppy pads are great for potty training but it has its pro and cons. Personally, I would use a puppy pad for short-term and of course with proper care. And gradually transition them to use the place wherever I want them to pee/poo permanently. That’s something you want to have in your mind. Once your puppy is house-trained, where do you want them to go, to pee/poo on a regular basis? Yes you are right; it may become difficult for people who are away from home for a few hours. Obviously that’s a challenge. But, in those situations you might like to use a crate along with a playpen. This is another article you might want to check-out on how to use a dog crate along with a dog playpen. In that way, your puppy can rest in the crate and when they need to come out for a pee they can do that too. I suggest you place some puppy pads in one corner of the playpen. So your puppy knows where to go for a pee or a poo when you are away. As a good practice, while paper training your puppy always place the paper or puppy pads at a distinct place. This programs your dog’s mind. This will also help the puppy to understand that there is a designated place to excrete and this habit will save you from a lot of mess. So house train them first. Then apply the same method when you want them to do it outside your home, like in the garden or on the terrace or wherever. Believe it or not I talk to my dogs. I tell them this is what you need to do, and I point it to them. Trust me it works, they understand more than we realize. 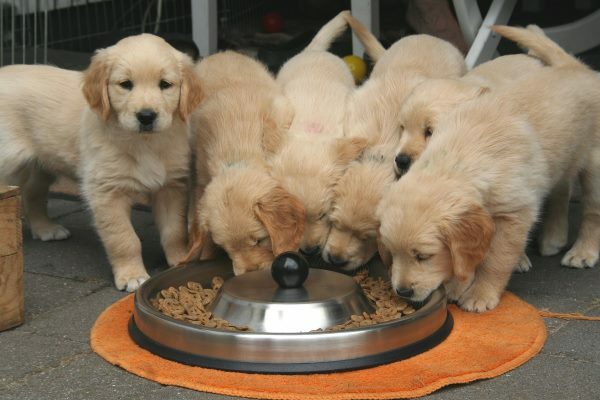 Always feed your puppy with the right food and in proper quantity. In case, you are having trouble in setting the right quantity for your pet; you should consider consulting a pet doctor for suggestions. As you know young puppies have a tiny and immature stomach, and if you over feed your dog, it will lead to watery and stinky stool. They will feel uncomfortable, and it can become a problem for your puppy. And you can very easily avoid this problem by proper planning and monitoring what suits your dog best. This one might seem insignificant but tiny rewards can actually play a colossal role in potty training your little dog. Just like humans, animals very much like to be loved and appreciated. 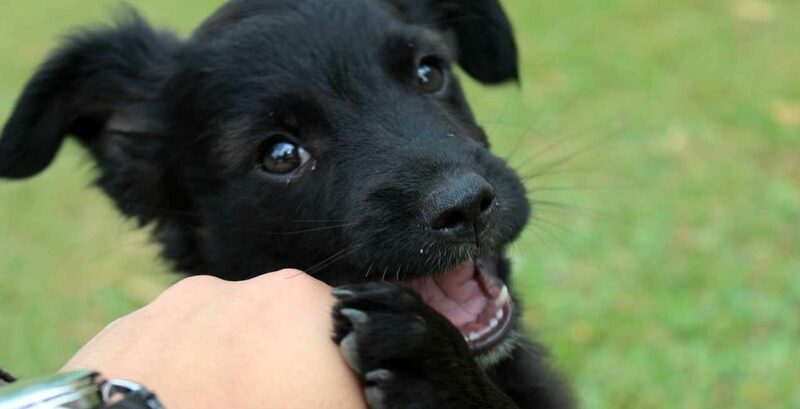 When your puppy does something good or positive, reward them right-away to reinforce that good behavior. So next-time, before taking your pet outdoors, you may want to have some little treat in your pocket. Also, talk in a positive tone when your puppy has used the designated spot to poop. If you follow these tips, you are inevitably going to teach your puppy to do the action at the right place in few weeks. But please be calm and patient. And never punish him in case he accidentally does the deed at the wrong place.